This year I have been inspired by the countless Pinterest images of the most beautifully wrapped Christmas gifts and decided that my wrapping game needed an upgrade. I have always admired little homemade touches at Christmas, and this year I decided I would give making my own homemade gift tags a go. I didn’t set my expectations too high. 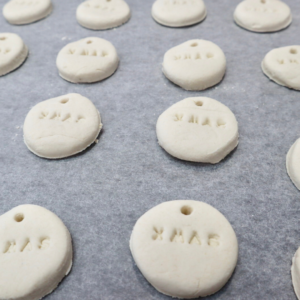 I wanted to make my tags from the basic salt dough recipe, and I wanted them to look homemade. I did, however, want them to be a touch whiter than traditional salt dough would allow, so I played with the recipe to get the colour I wanted to achieve. I did this by adding in a small amount of white acrylic paint (I had some leftover from painting my Halloween pumpkins). This is a no-bake recipe allow enough time to dry your tags they can take between 48-72 hours. The thicker they are, the longer they take to dry. In a medium bowl mix the flour and salt. In a small bowl or measuring jug combine the water and the paint until completely combined. Add 1/2 of the paint water to the flour mixture. Mix with a wooden spoon until it comes together. Slowly add the rest of the paint water until a dough ball forms. You may not need all of the paint water to form the dough. Turn the dough ball onto a lightly floured surface and knead for 30 seconds to create a workable dough. Roll you dough ball to your desired thickness and cut into your desired shapes, adding a small hole for ribbon. 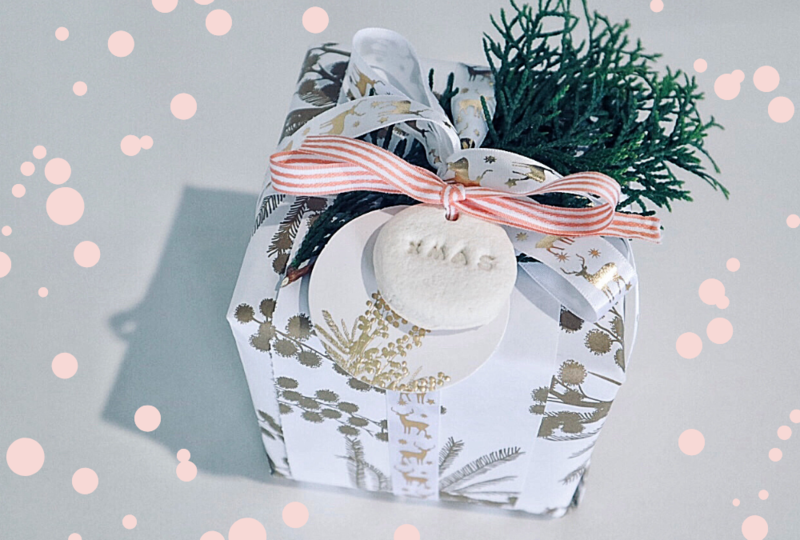 Place your gift tags on a tray lined with baking paper and air dry for 48-72 hours, turning every 12 hours.